Rice, savory beef, tons of veggies, and fresh green herbs are having a bowl party and you’re invited. We had these last night and then I ate the leftovers as a salad for lunch today so I think a big thumbs up is appropriate. These are easy to make and extremely versatile. Leave out something if you have a picky eater (or forget to buy an ingredient like green onions) and feel free to add other veggies like peppers (my addition), edamame, or sprouts. This recipe comes from a couple of places and I made my own additions/substitutions so I’m not really sure who should get the credit. I first saw it in Bon Appétit and then saw a version on Shutterbean and then again at my local Publix. As I mentioned, I added more veggies and more herbs so at least I can take credit for the greenery. 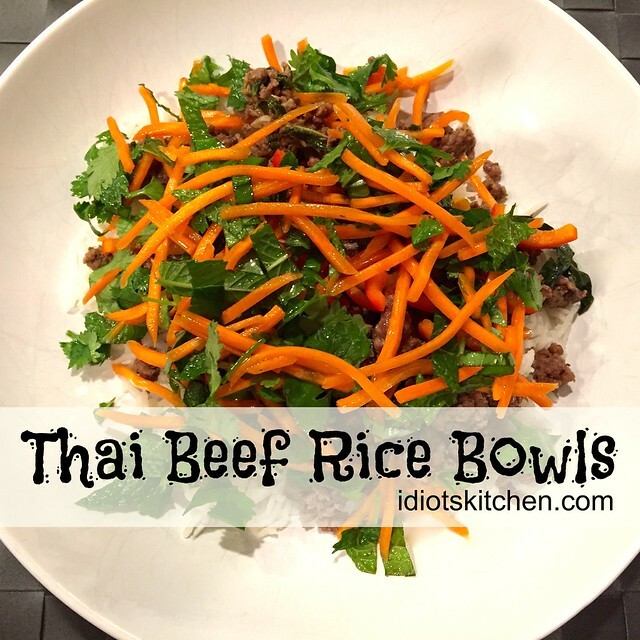 Rice takes about 20 minutes to cook so that should give you ample time to do all the prep and cooking for the rest of the Thai Beef Rice Bowls. Right off the bat I should tell you that even though this has a jalapeño pepper, it is not at all spicy. In fact, next time I think I would leave the seeds in the jalapeño just for a little more kick. 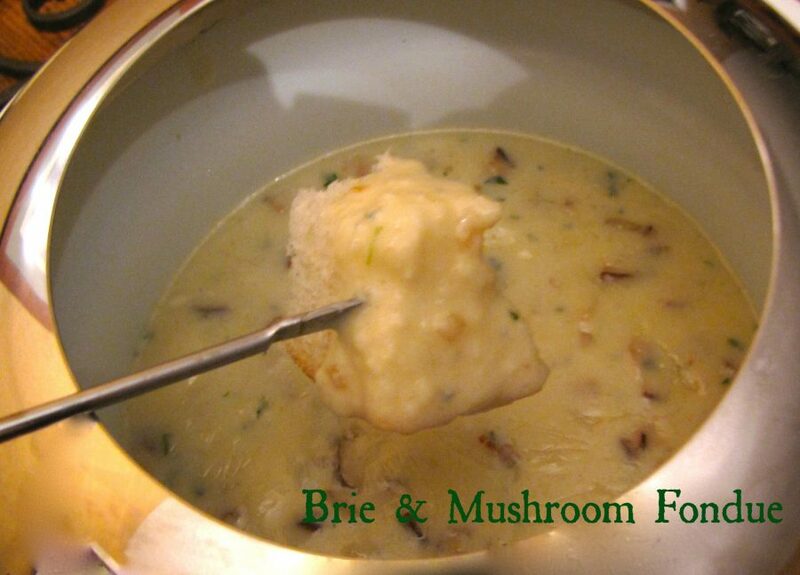 Same goes for the garlic, I used 4 big cloves but I think you could use even more. The garlic is thinly sliced so that keeps it from getting quite a potent as finely chopped or pressed garlic. 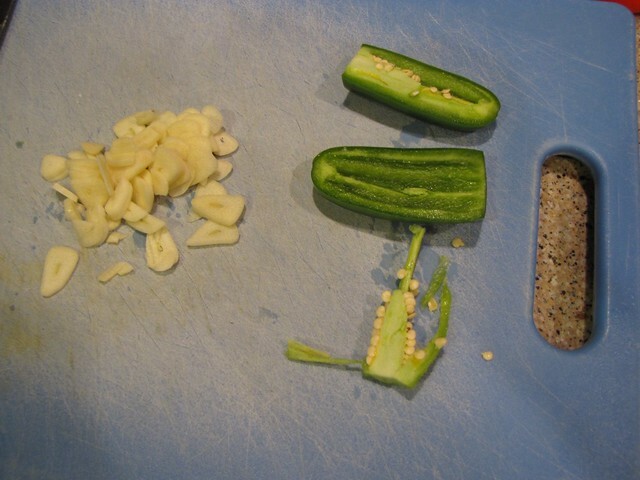 Peel and thinly slice 4-6 cloves of garlic and finely chop 1 jalapeño pepper. If you want to get all your prep work out of the way now, you should also clean and pluck the leaves from a big bunch of fresh basil, 2-3 cups. You will also need 1/2 cup of fresh cilantro leaves and 1/2 cup of fresh mint leaves. 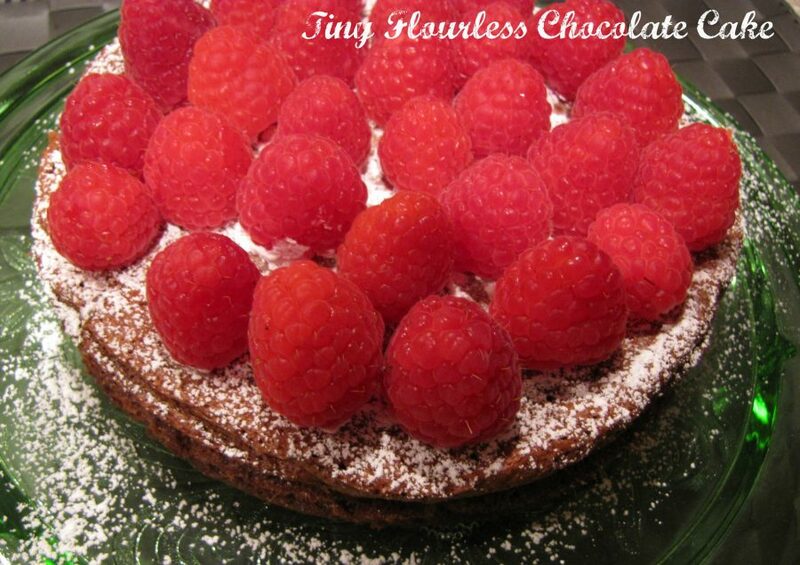 I’m sure I used even more mint, it’s the secret ingredient to this dish! I’ve also seeded and chopped some small bell peppers, about 1/2 cup. I have these tiny peppers I’m trying to use up but any color of regular bell pepper would be fine. 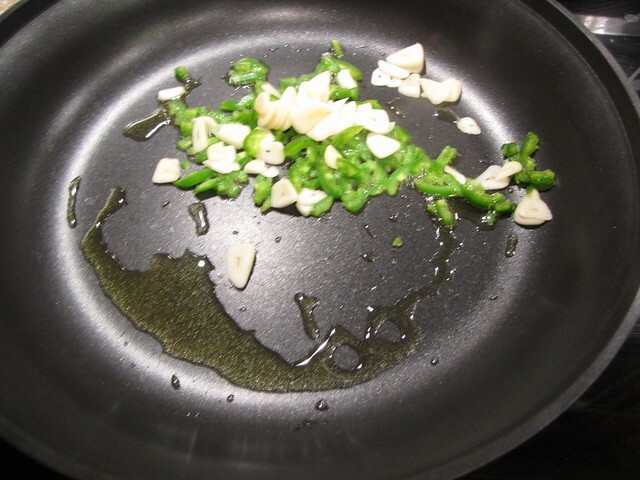 Heat 1 Tablespoon of olive oil in a large skillet over medium high heat. Add the garlic and jalapeño and cook for 30-60 seconds. Try to keep the garlic from turning brown as that will make it bitter. 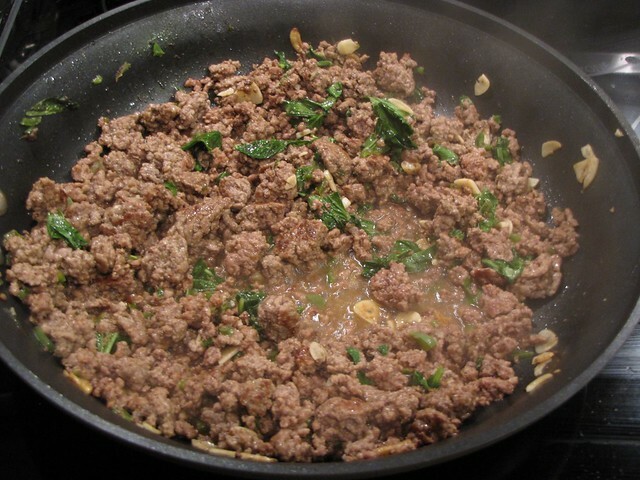 Add 1 pound of lean ground beef and turn the heat up to high. 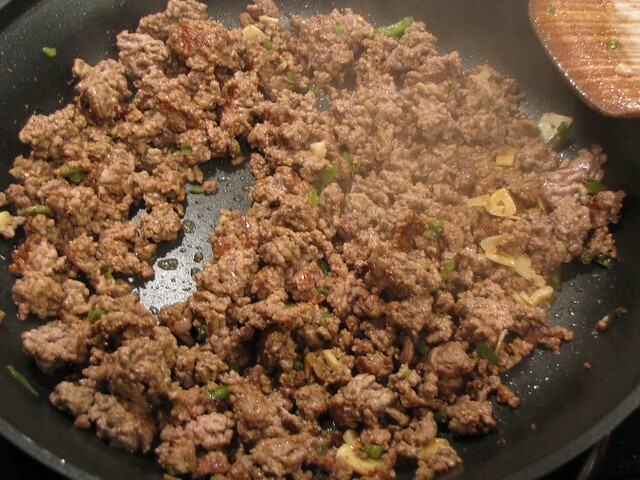 Use a spatula to break up the beef into little bits and also to incorporate the garlic and jalapeño into the beef. 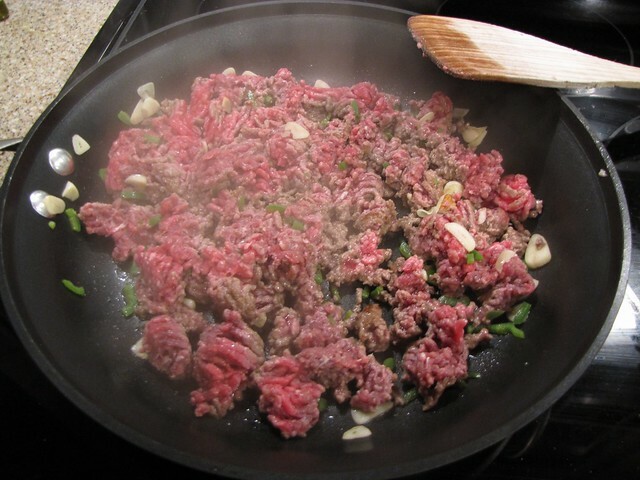 Cook the beef until nicely browned and no longer pink. I like to get some crispy little browned bits on there for extra flavor. When the beef is nicely browned, add ½ cup of chicken broth, 1 Tablespoon of Asian fish sauce, and 3/4 of your pile of fresh basil leaves. Save a little of the basil for the carrot & herb slaw that will top the bowls. More on that later. 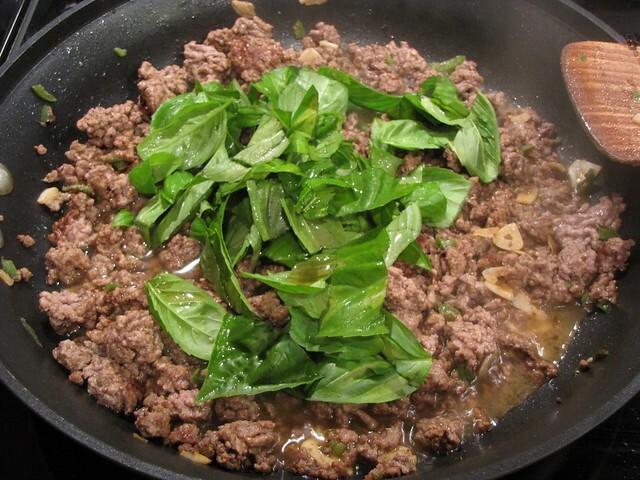 With the heat on high, the basil should wilt into the beef. Cook 2-3 minutes more until most of the liquid has been absorbed then squeeze in the juice of ½ a lime, season to taste with salt & pepper, and then turn the heat down to low or warm and hold the beef until you are ready to assemble the bowls. 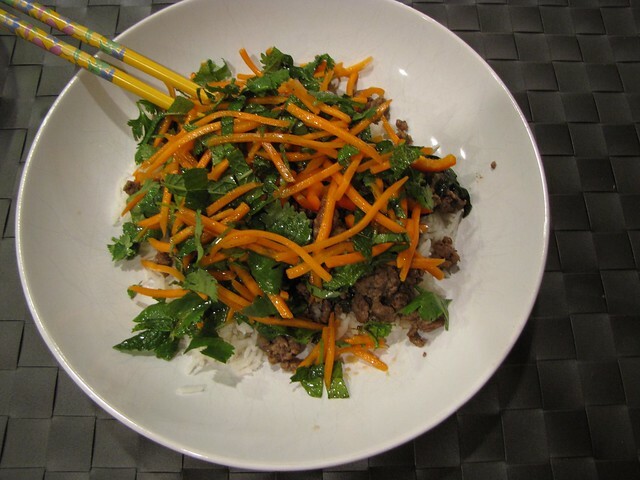 In a medium bowl combine 1 cup of matchstick or julienned carrots, ½ cup of chopped fresh cilantro, ½ cup of chopped fresh mint, and the remainder of the basil, chopped. I do a rough chop on the herbs so they are in pretty big, leafy pieces. It’s nice to be able to see and identify them in the slaw topping. 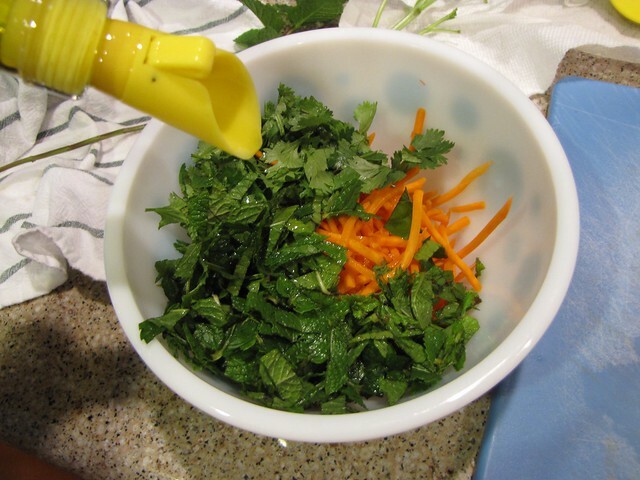 Add 1 Tablespoon olive oil, the juice of ½ a lime, and a bit of salt & pepper to the carrots & herbs and toss to coat. In a separate small bowl, combine 2 Tablespoons Tamari (for gluten free) or soy sauce, the juice of 1 lime, 1 Tablespoon fish sauce, and 1 teaspoon sugar. Stir until combined and the sugar has dissolved. 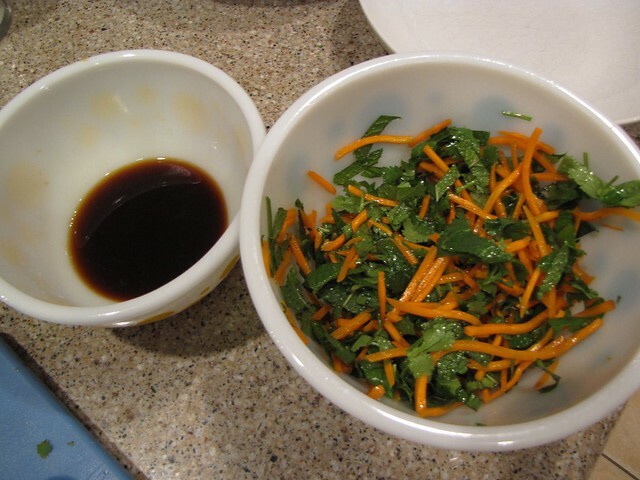 Pour 1 Tablespoon of this soy sauce dressing over the carrot slaw and toss to coat. 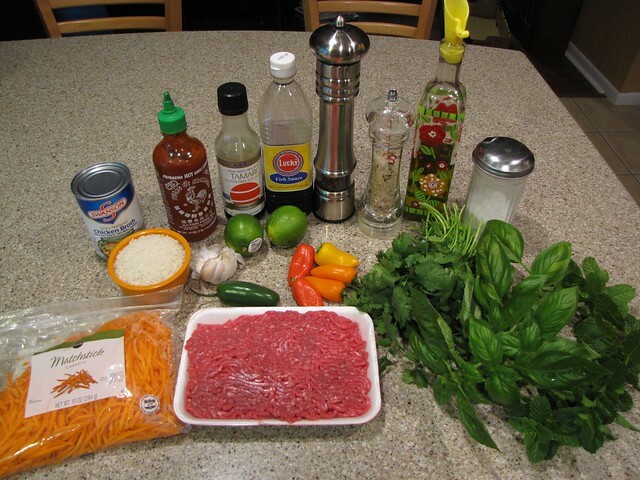 Now you have all the parts and can prepare the Thai Beef Rice Bowls. 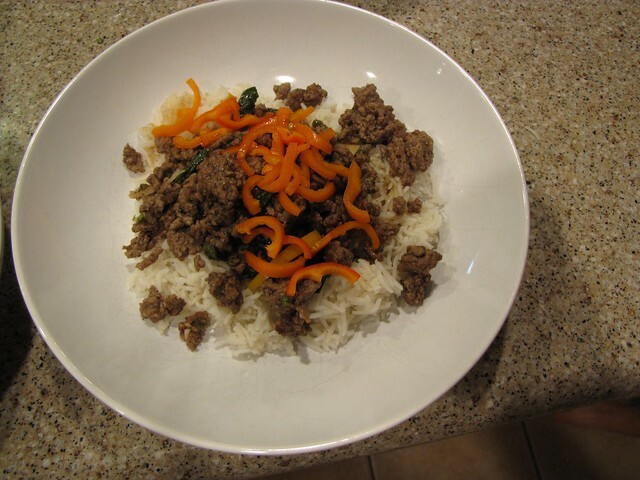 Place a serving of rice in the bottom of the bowl and top with a generous scoop of the warm beef. I added some of my sliced peppers on top then seasoned this with a bit of the soy sauce dressing, about 1 Tablespoon. Add a big pile of the carrot and herb slaw on top! Serve the remaining soy sauce dressing on the side. 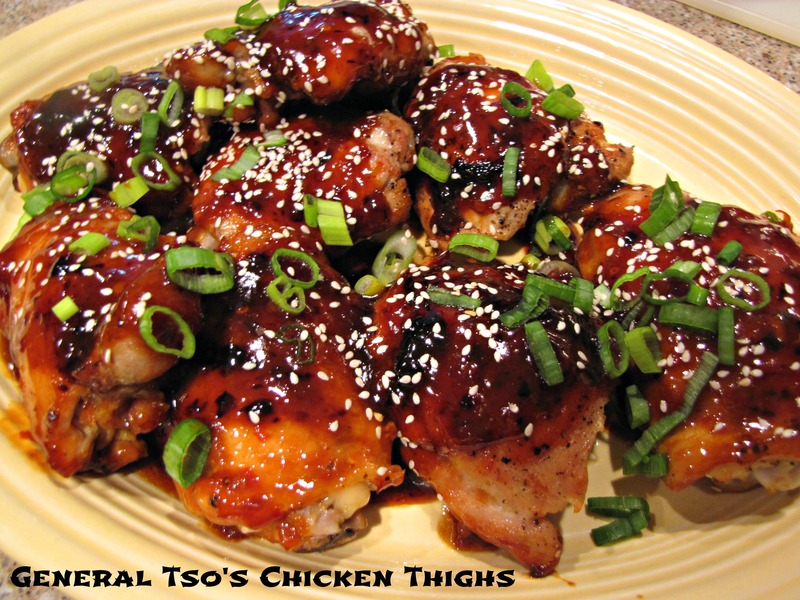 If you like things spicy, pass the Sriracha sauce! I was extremely happy with these Thai Beef Rice Bowls. The carrot & herb slaw topping is so bright and fresh I could eat it by itself. This makes 4 moderate servings and would be great if you served something else like whole, salted edamame pods or spring rolls. We made this our whole dinner so we had two bigger servings with 1 very generous leftover. It’s a light & healthy meal with a little twist. Change it up and add whatever veggies are in season or growing in your garden. YES! I’m sure there is some sort of tofu thing you could do in place of the beef. Or even add some kind of beans. The carrot topping was my favorite part. This would be good with meat or veggies. I keep meaning to send you a roasted califlower recipe I use…. Maybe I can get that done soon. 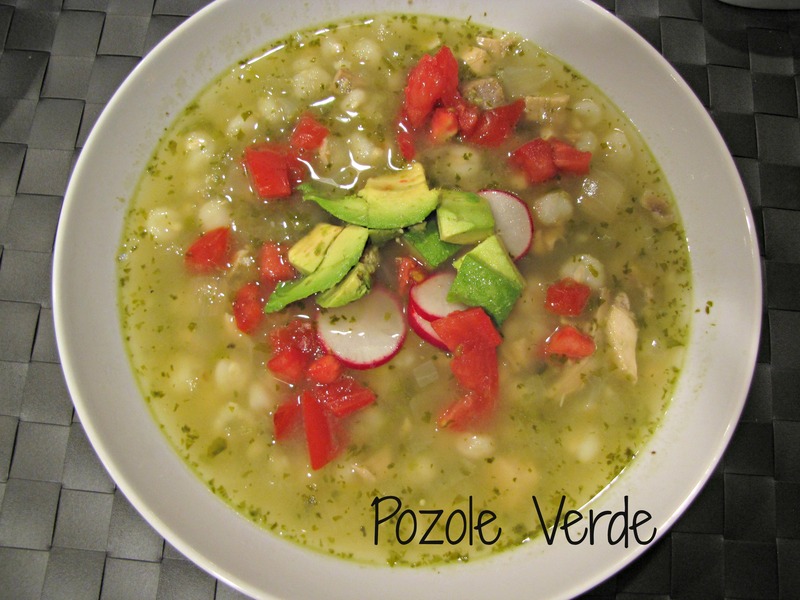 I would love any recipes you’d care to share!!! Your granola recipe is still my favorite!